Have you ever looked at something and said to yourself, "I'd like to just keep things simple". I know I have, in fact more so today than every before. Minimalism is spreading in all corners of the globe, and it's only getting stronger here. 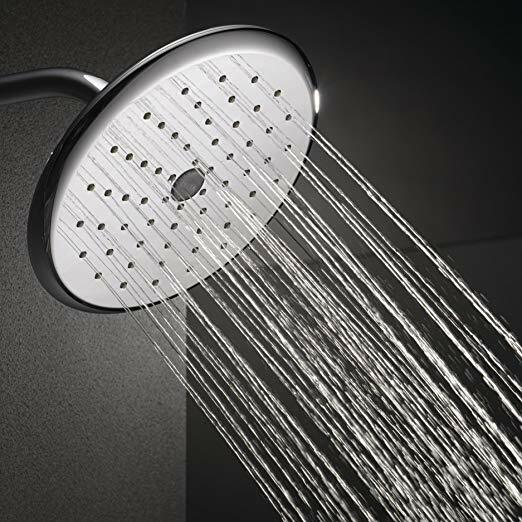 How this relates with the Delta RP52382 rain shower head is that, it keeps things simple. Especially if you look at it from all angles. With beautiful rounded edges, a combination of metal and plastic all throughout, it would be a great addition to an individual who has a very simple layout in their bathroom. Thanks to Delta Faucet for making budget friendly shower heads with exceptionally better quality (in some cases), giving you more bang for the buck than you could get with some other brands. Let dive into some of the important aspects of this shower head, we will talk about the main features, advantages, and disadvantages. In the end, we will wrap up with the bottom line. Let's talk about features, the most important ones in particular. No boring fluff, just what you came here before you make a buying decision. Easy To Clean Nozzles: Today our water supplies have plenty of added minerals and chemicals to benefit our health, where this gets to be a problem is where the water come out from. In the instance of shower heads, the small nozzles located on the shower head can become clogged due to lime build-up. It wont be the case here, thanks to the silicon/rubber nozzles that channel water into only ONE direction and will continue to resist mineral build-up. Every now and then, I still recommend you give them a good brush as a good safety measure. Versatile Design: This is an excellent feature, made into the design of the entire product. Being versatile in all environments is crucial for user satisfaction, we're not all the same after all. One thing this one does well is be versatile due to its design. The swiveling ball joint that lets you direct it into a direction you wish, feels like it is made of hard quality material. Steady Water Flow: Many would like to impress you with multiple spraying settings, it's not the case here. I find it crucial that you know this shower head has no switchable spray settings, instead there's just one. There is a beauty in knowing that you can just select one setting and it will serve you the same way until it no longer works. Because of that one setting, the nozzles direct water into a very precise direction (straight ahead), giving you even water pressure throughout the entire coverage area. Let's talk about the advantages associated with this unit. There's are a few, so I'll break them down in detail in a way that I think will entice you to look into it. Build Quality is GOOD: While for the price you can't expect much metal, you can expect good quality plastic in some instances. With the Delta RP52382, you get solid plastic that mimics metal in a way. Main parts such as the swivel ball is actually made of metal, along with the micro filter with the flow restrictor. For Minimalists and Non-Minimalists: Some people like it when their place is clean, neat and has few things that can off-set the overall theme and design of a place. For those minimalist friends, you can go ahead get this shower head because it will serve you well in your quest to keep things simple (one color, rounded design, a single setting, single water pressure). It Will Save You Water: Given the fact there's only one setting, there's only one pressure from the shower head. However, the one pressure at times can be low (depending on your homes water pressure), in the long term you can save a bit of money. However if you want the full blast, just remove the flow restrictor. Reasonably Priced: In a nutshell, you will get this whole package for around 65-70 dollars. While being made of mostly plastic, one thing is certain, it will last you for a few years at least. I looked further online to see who else has bought this model, and good reviews signify good overall quality. Nothing is perfect in this world, and this shower head is no exception. While I could not find many negative drawbacks, I do think there's a thing or two that you may NOT like about this shower head. Low Water Pressure: This has been a minor complaint with some, saying that low water pressure combined with this shower head has caused some seriously low output. While you can remove the restrictor and ultimately fix this issue. Mostly Plastic: This may be a turn-off to some, since everyone associates plastic with poor quality. I would not blame them, this one is made of plastic and to some no matter what I say, is a no go. While being made of solid plastic, it seems to hold-up well through the test of time. Is the Delta RP52382 rain shower head for you? From what I mentioned above, its a great value for what you get. While features are nice to have, when you have a minimalistic design with the primary job being done exceptionally well, there's no room for complaints. How does it stack up against other rain shower heads? You can find out by clicking the above navigation bar and choosing my full buyer's guide that compares multiple units. One more thing, if you enjoyed this review, please share it with others. It would be very helpful!